How is your business preparing to deliver more mobile video, faster? Change is constant in business. Look no further than the device you’re probably using to read this article. Chances are you’re viewing this on mobile, since mobile usage overtook desktop computer usage years ago. And in a roundabout way, this shift from desktop to mobile means your company will be expected to deliver more, faster, in the near future. 95% of Americans own a cellular phone. Smartphone adoption has continued to grow: 77% of Americans own one, and the trend will likely continue up and to the right. 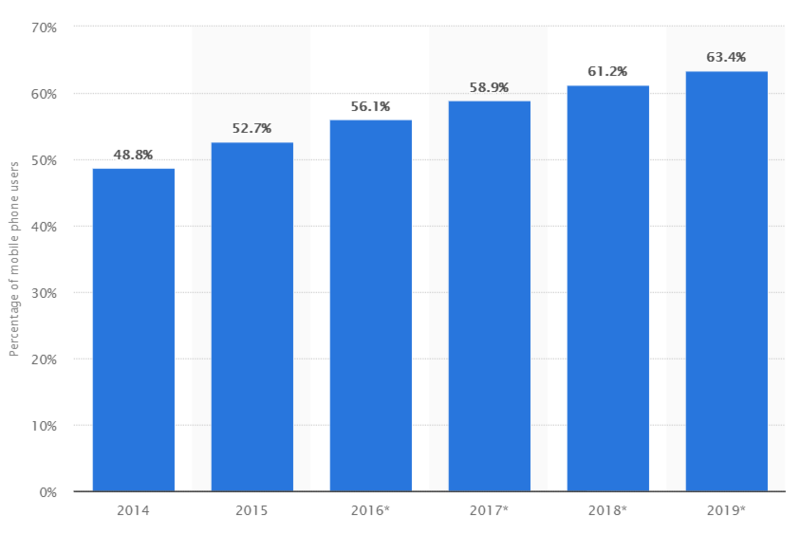 More to the point, mobile internet usage is also expected to continue its endless growth, with up to 63.4% of mobile users worldwide expected to use their devices for Internet browsing through the year, another figure continually on the rise, year over year. Mobile internet usage to continue unabated through 2019 and beyond. Image courtesy Statista. The takeaway here is simple - more people than ever have mobile devices, and more people than ever are using them to browse online content. Your company, of course, already has a mobile-optimized experience for Web. Unfortunately, that won’t be enough. With the unending growth of both mobile adoption and mobile internet usage comes the completely predictable growth of mobile data usage. Some estimates see US mobile data usage alone increasing nearly 6x within the next six years. As more mobile users consume more data, it’s natural that they eventually come to expect higher speeds and throughput. 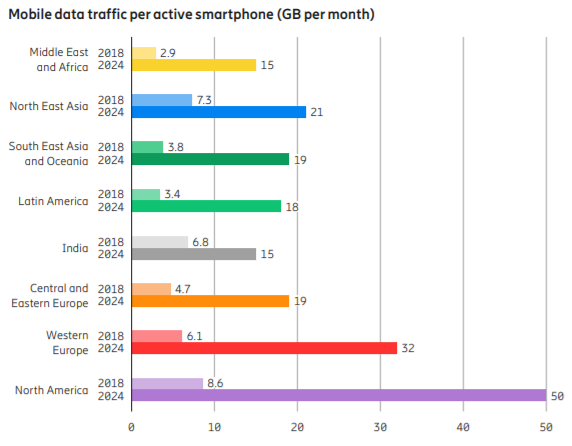 US mobile data usage will grow from 8.6BG monthly to 50GB monthly by 2024. Image courtesy Ericsson. And they’ll get it. 5G, the next-fastest iteration of mobile network, has already debuted with limited service in 2018 and will be rolling out in North America through 2020. 5G is estimated to be 20x faster than 4G LTE, and will also provide this speed and increased bandwidth to support significantly more devices within an area. It’s possible you might not need a 5G device yourself for some time, but there’s a very specific reason your customers might not be able to wait. By 2022, 82% of online traffic is expected to be video. Some estimate that video will make up 80% of online traffic by this year. Whatever the case, people are ravenous for video content, and with the pending increases in bandwidth and speed to stream it, your company will be expected to deliver more of it. But I’m sure you’ve already put together plans, if not already-active processes, to produce videos that engage, educate, and inspire your current and future customers all year long. You’ve also probably compiled your budget, which might be anywhere from a few thousand dollars for the year to millions. So, how are you going to manage and distribute this costly video inventory? To whom, and when exactly? By what channel(s)? While people all over the world are primed to consume more video, that doesn’t mean they’re suddenly open to receiving any video from anyone, or any kind of messaging in general, particularly one that isn’t relevant to their interests. 1 in 4 US internet users utilize an ad blocker. 57% of customers “break up” with brands when “unnecessarily spammed” with irrelevant, repetitive messaging. While your plans for 2019 may involve the expensive and time-consuming process of producing video, you probably don’t want all that time, effort, and cost you invested into producing them to be ignored and blocked, much less annoy your customers in the process. In order to deploy large quantities of video (or any kind of messaging) at scale to the right person at the right time, you need deep, connected insights on your customers across their entire journey, from that initial marketing touch to point of sale to onboarding to post-sale customer lifecycle. Learn how cloud computing leader DigitalOcean seamlessly integrated its customer data with its customer messaging applications to stream relevant messaging in real time to hundreds of thousands of customers. Better yet, join a weekly group demo and see how you can do this yourself.